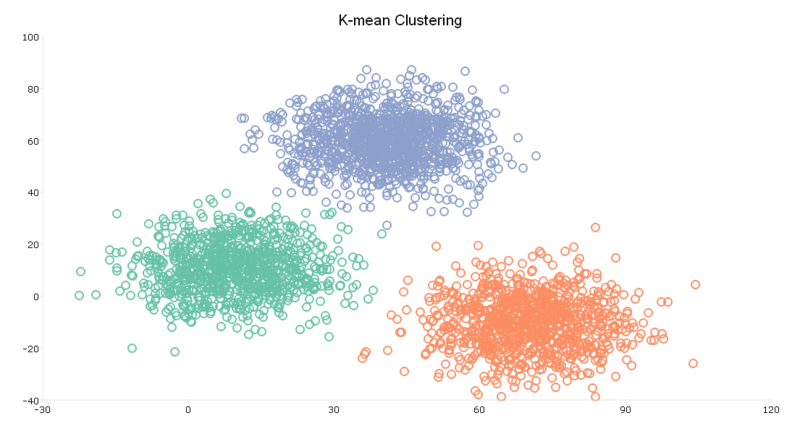 Visualize a 2D dataset to identify the number of clusters. Fit a k-means model to dataset using kmeansFit. 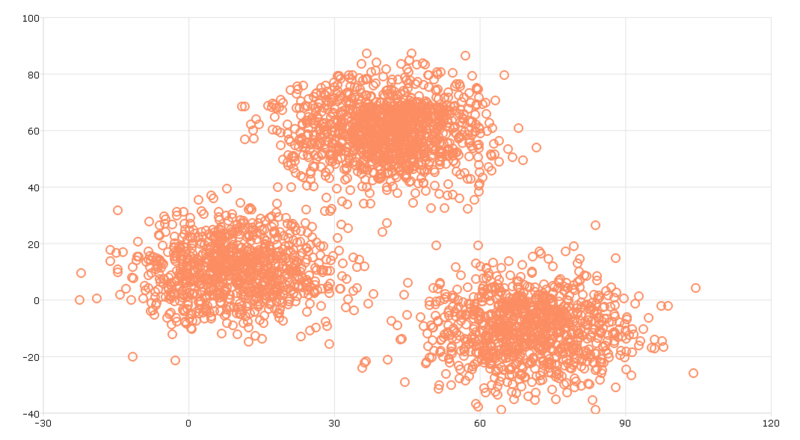 Plot clustered data using plotClasses. Add centroids to the plotted data. The data for this tutorial is stored in the file kmeans_data.csv. This tutorial uses loadd to load the dataset into GAUSS prior to fitting the model. The function loadd uses the GAUSS formula string format which allows for loading and transforming of data in a single line. Detailed information on using formula string is available in the formula string tutorials. A formula which specifies how to load the data which is optional if the complete dataset is to be loaded. The resulting plot shows three clear clusters and suggests that we should use k = 3 for fitting our k-means model. The k-means model is fit using the GAUSS procedure kmeansFit. The kmeansFits procedure takes two required inputs, a feature matrix and the number of clusters. In addition, the kmeansControl structure may be optionally included to specify model parameters. centroids kxP matrix, containing the centroids with the lowest intra-cluster sum of squares. assignments Nx1 matrix, containing the centroid assignment for the corresponding observation of the input matrix. totalSS Scalar, sum, over all observations, of the squared differences of each observation from the overall mean. clusterSS Scalar, sum of squared differences between each observation and its assigned centroid. elapsedIters Scalar, the number of iterations taken by the 'start' with the lowest 'clusterSS'. The GAUSS plotClasses function provides a convenient tool for plotting the assigned clusters. The plotClasses function produces a 2-D scatter plot of the data matrix with each class plotted in a different color. The procedure requires two inputs, a 2-dimensional data vector, x, and a vector of class labels, labels. The label vector may be either a string array or numeric vector. Finally, the plot can be formatted by including an optional plotControl structure. Declare an instance of the plotControl structure. Use plotSetTitle to specify, the wording, font, and font color for the graph title. Use plotSetGrid to turn grid off. The plot shows the same scatter point as our initial plot of the data. However, the plot now shows three clusters, plotted in red, green, and blue.